Get the latest updates from 7th Regiment in the corps’ recently-published newsletter. The Academy’s Memorial Day Picnic and Season Preview event will take place on Monday, May 25, in Gilbert, Arizona. Blue Devils C’s 2015 production “The Beatles,” will pay tribute to some of the Fab Four’s greatest hits including "Yesterday," "Can't Buy Me Love” and "Eleanor Rigby." The Blue Knights kicked off their first week of all-day spring training rehearsals. Check out all that they’ve been up to in this blog post. Blue Saints’ 2015 production, “The Demon of Seville,” will feature works by Rossini, Beethoven and Stephen Sondheim. Youth Education in the Arts, the parent organization of the Cadets, has several job openings. Now a week into spring training rehearsals, check out this video update from Carolina Crown. Check out this video of the Cavaliers’ horn line practicing during a preseason rehearsal at Benedictine University in Lisle, Illinois. Genesis is featured in a recent article published by UT Austin’s School of Journalism. You can sponsor an American Flag and see the corps perform as part of Jersey Surf’s Memorial Day event in Sicklerville, New Jersey. Meet the members of Louisiana Stars’ 2015 visual staff. Tickets are now on sale for the Madison Scouts’ Drums on Parade “Preshow Tailgate.” Your admission gets you a themed pint glass that salutes the corps’ 1975 DCI World Championship. Oregon Crusaders have open positions for trumpet, mellophone and in its color guard section. The corps will get its spring training underway on May 29 in Willamina, Oregon. 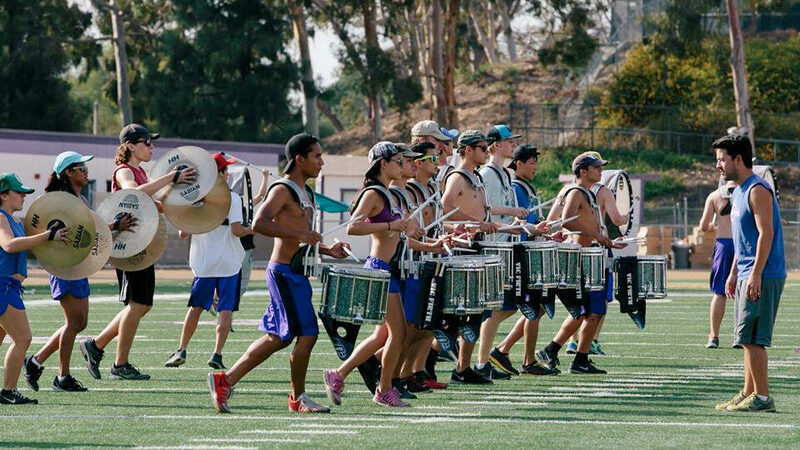 Check out these photos taken during Pacific Crest’s May rehearsal camp. The inaugural “Marty Gras” benefit concert will be held in honor of the late DCI Hall of Fame and Phantom Regiment percussion instructor Marty Hurley on Thursday, May 28. Proceeds from the event in New Orleans will benefit the Marty Hurley Band Endowment at Brother Martin High School. Raiders’ 2015 production, “From the Ashes,” will feature music by Samuel Hazo, Ryan Nowlin and DCI Hall of Fame member Jay Bocook. The latest “SCV: Backstage” video previews the corps’ summer season ahead. The Spirit of Atlanta Cymbal Line Facebook page has an inside look at the corps’ preseason rehearsals.